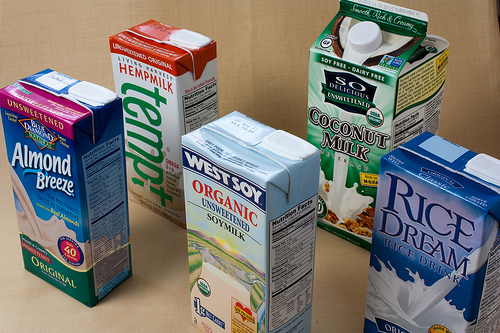 I have tried many non-dairy milks over the years and found very few that meet all my overly-informed foodie requirements, (organic, non-GMO, soy-free, etc). I wanted to reduce my intake of soy products since being a vegetarian often lends itself to an abundance of tofu, veggie meats, milks and products that contain soy protein/lecithin. The last two are commonly used as thickeners for products like ice cream and non-dairy cheese. But my latest aversion- wanting to avoid carrageenan- has left me with a surprisingly limited selection. I found that carrageenan, a common seaweed/algae-based thickener, can cause inflammation in the stomach and bowel. While non-toxic outside of the body once the chemical process of digestion begins it can cause upset in many sensitive people. I used to wonder why I would experience a mild irritation in my stomach after having my morning tea with milk or oatmeal with store bought almond or coconut milk. After some research, began to suspect carrageenan. So whats a veg foodie to do? Make my own! I also found a way to use the pulp left! !